Jeremy Wadsworth | The Blade Toledo Walleye forward Bryan Moore goes airborne just after scoring a goal against Komets goalie Zach Fucale in Game 1 of the Central Division semifinals at the Huntington Center in Toledo, Ohio. Jeremy Wadsworth | The Blade Toledo forward Zach Gallant battles Komets defenseman Josh Elmes during Game 1 of the Central Division semifinals Friday at the Huntington Center in Toledo. Jeremy Wadsworth | The Blade Toledo Walleye forward Greg Wolfe, right, battles defenseman Cody Sol for the puck in Game 1 of the Central Division semifinals at the Huntington Center in Toledo, Ohio. 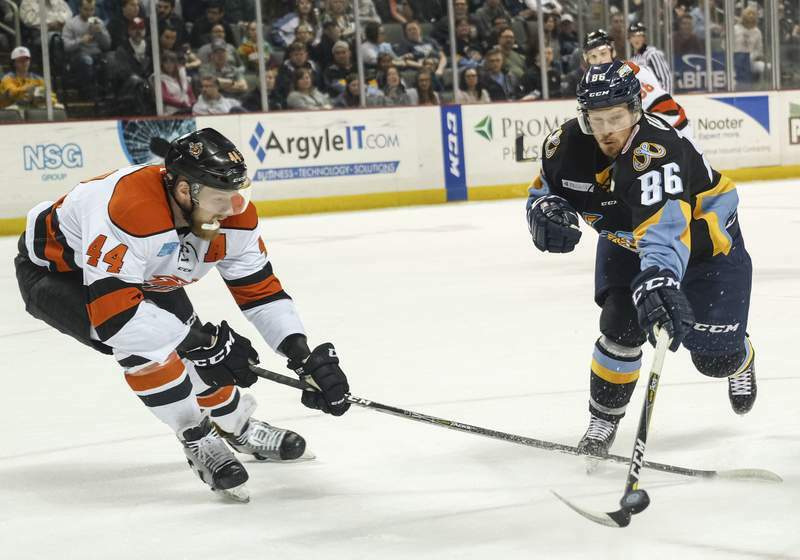 TOLEDO – Successful teams in the ECHL's Kelly Cup playoffs are able to play intense, physical games. They're able to take things to the edge of out of control without actually crossing the line. We can debate the quality of the officiating in the first two games of the Central Division semifinals – it wasn't good – but that just becomes an excuse for a team down 2-0 after being walloped 6-0 by its rival in Game 2. 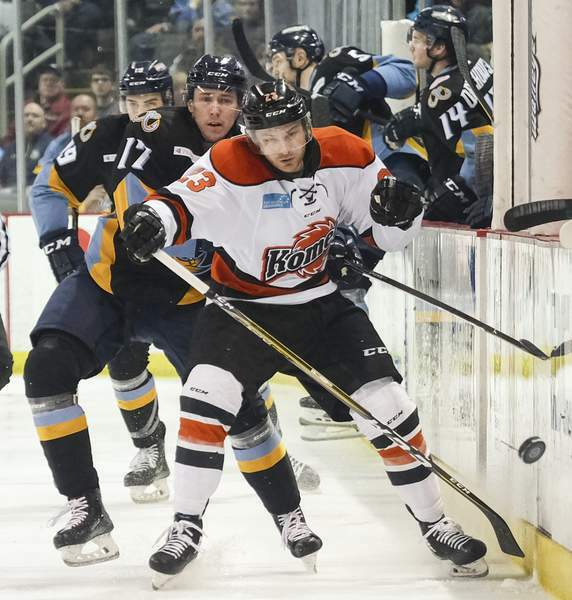 That's the situation the Komets are in heading to Wednesday's Game 3 at Memorial Coliseum against the Toledo Walleye, which has played feisty, antagonistic hockey, yet controlled their emotions better than Fort Wayne. Don't take your kids to this best-of-7 series and expect them to come away understanding the value sportsmanship. We've seen sucker punches, face-washes, elbows, hitting behind the play, showboating and even the snatching of the game pucks from the winning team. Toledo has done the majority of this, but whatever it's doing is working. 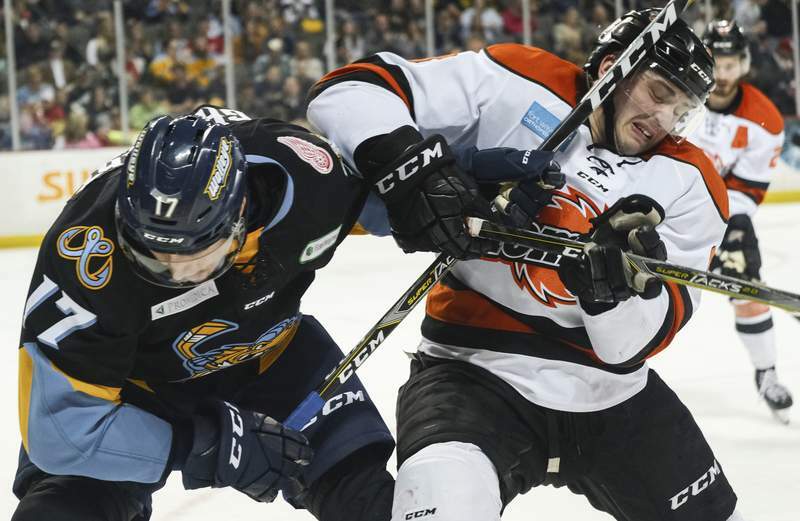 The Komets have taken 20 minor penalties, five more than the Walleye. Toledo has scored on 4 of 11 power plays, including 4 of 7 in Game 2 at the Huntington Center. Fort Wayne is 1 for 6, including a 0 for 3 showing Saturday. 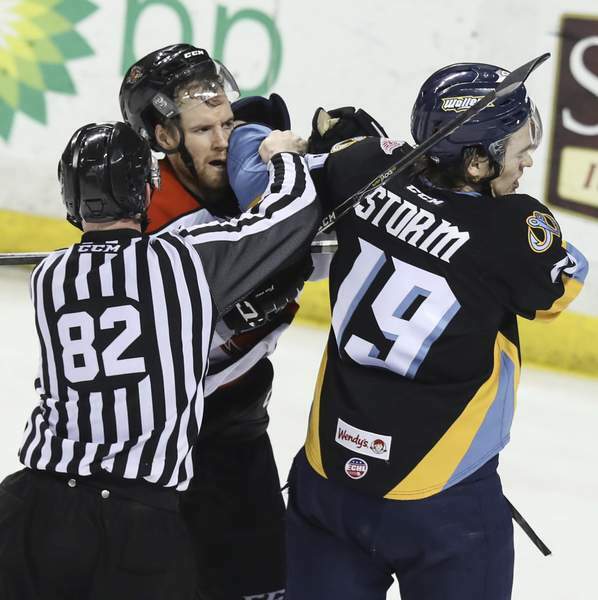 The two largest post-whistle fracases Saturday – one started by Fort Wayne's Ryan Lowney checking Dylan Sadowy to the ice; the other beginning with Fort Wayne's Cody Sol leaving his feet to check Greg Wolfe – resulted in power-play goals and a 4-0 lead for Toledo. The referees blew both situations, not giving Sadowy a penalty for his part in the first melee and allowing Toledo's Brenden Kotyk to get away with punching through linesmen to get at Sol. But Fort Wayne hasn't managed its emotions well enough, leading to the special teams disparity, fatigue for top players and a lack of momentum. Taking penalties is fixable if the leaders, led by captain Jamie Schaafsma, are able to get everyone to smarten up. More concerning is that the Komets still struggle with fundamental things: a) failing to get the puck chipped deep into the offensive zone to set up the forecheck; b) continually turning the puck over on easy plays in the defensive zone; c) keeping track of defensive assignments. It just appears this roster is never going to be able to consistently smack the puck to places the other team isn't at the offensive blue line, something that has led to two Toledo goals. And Toledo has three even-strength goals from players skating unabated through Fort Wayne's zone. The Komets were able to qualify for the postseason because they had so many terrific individual players. The offensive nucleus of J.C. Campagna, Shawn Szydlowski, Brady Shaw, Justin Hodgman, Jake Kamrass and Marco Roy has totaled two goals, two assists and 25 shots in this series, with Shaw and Kamrass accounting for both goals and 11 of those shots. 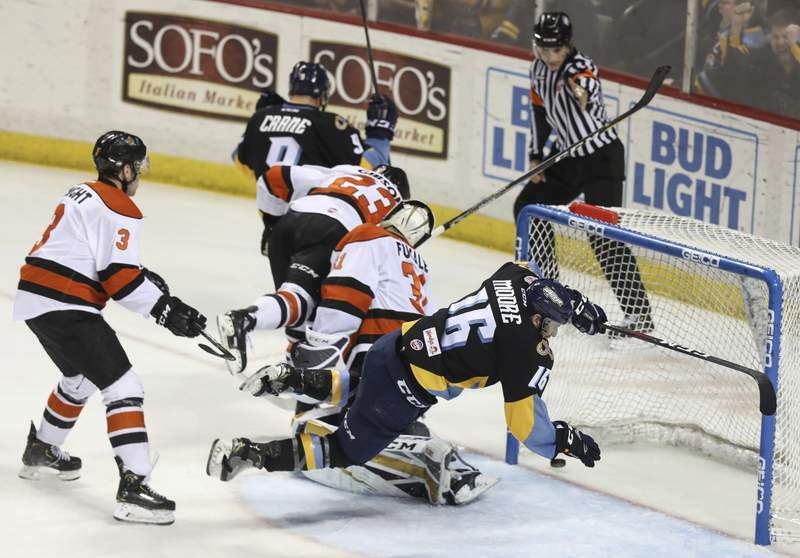 Were it not for Komets goaltender Zach Fucale, who has stopped 72 of 81 shots, things would look more dire. Toledo's Pat Nagle has stopped 51 of 53 shots, including 23 for the shutout, but he hasn't been tested much. They say in hockey that it's not a series until someone loses on home ice. In that respect, Komets fans shouldn't panic. But the Komets were better on the road during the regular season than at the Coliseum. So, maybe panic is in order.